Jans class surveyed parents to determine which method the school should use to send home report cards. Their survey provided 5 options: send out report cards by mail, send them out by e-mail, telephone home, parents pick up the report cards at the school, or students take the report cards home. Jan created a pie graph from the results of her classs survey and arrived at a conclusion that she presented to the principal. 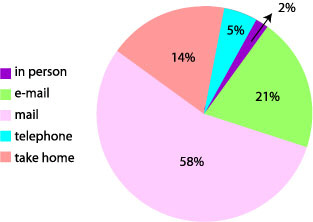 By showing the percentage breakdown of parents choices in the pie graph. Mailing the report cards is the most preferred method and e-mailing is the second most preferred method. By creating a pie graph. Parents do not like receiving report cards. What did Jan reasonably conclude? How did Jan justify her conclusion? How did Jan arrive at her conclusion? What conclusion would be unreasonable? What is the least preferred method for parents to receive report cards? What other type of graph could show this data effectively? A school is trying to decide which sandwiches they should sell in the cafeteria. They use a database to track the kinds of sandwiches that students requested. Which sandwich is the most popular? Which sandwich is the least popular? Which type of sandwich sells about the same in each grade?